According to a study put together by Jon Otter, PhD FRCPath Imperial College, patients are prone to acquire a pathogen from a pervious occupant of a room even after disinfection. This creates a “room lottery” where your greatest risk of contracting a hospital-acquired infection (HAI) is from the person who occupied the room before you. With bacteria lingering on surfaces, pathogens can also be transferred from these surfaces in rooms to the hands of healthcare workers. These transfers of bacteria happen without direct patient contact. To make matters worse, without proper hand hygiene these pathogens can inadvertently be spread from healthcare workers back to patients. Dr. Otter suggests that in order to prevent HAIs, trying new methods or improving existing procedures of disinfection are important. To improve existing methods staying organized is vital. Creating checklists to assign people to clean different things can be helpful. 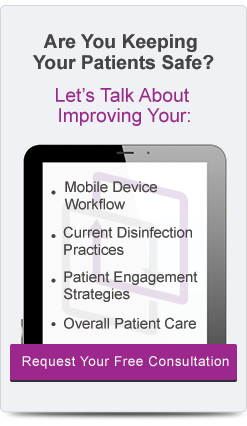 Focus on high touch sites and decide what agent or device is best for disinfection. A cleaning and disinfection process should be conducted at least once or twice daily. A more stringent protocol should be utilized for terminal cleaning. It is important to go beyond cleaning just to make a room look visually appealing. A room may look clean, but may still be contaminated by microbes. Microbiological samples of rooms can be taken to determine the level of contamination after cleaning, but this is a costly procedure and hard to conduct routinely. An alternative to microbiological sampling to test cleaning efficacy is using an ATP (adenosine triphosphate) reader which can help determine if a surface is contaminated with microbes. Another method of testing the effectiveness of a cleaning process is with the use of fluorescent markers. Markers can be placed in a room allowing the cleaning to be assessed with a black light after. This can help healthcare workers learn to clean spots they miss and improve their cleaning and disinfection techniques overall. Metals such as copper and silver are a great microbicidal material. When placed on objects in patient rooms such as bedrails, overbed tables, IV poles, chair arms, nurse call buttons, and much more they help to lower HAIs by 58%. Organosilane and light-activated chemicals can create easy to clean mircobicidal surfaces. Materials with Sharklet pattern or liquid glass reduce deposition and improve cleanability. Hydrogen peroxide wipes can significantly reduce microbial contamination in rooms and hydrogen peroxide vapor is also very effective. Patients admitted to a room disinfected using hydrogen peroxide vapor are 64% less likely to receive any MDRO (multi-drug resistant organism). Another route to consider is using UV technology. 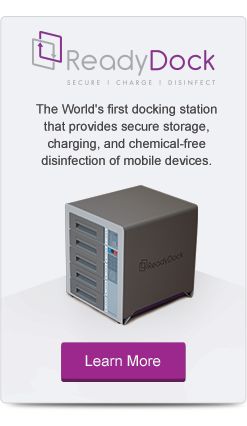 UV light can be utilized to disinfect everything from rooms to mobile devices. It is chemical free and very effective for disinfection. Using light removes the need for harmful chemical making disinfection easy and mess free. New designs of hospital equipment and furniture to increase the ease of cleaning and disinfection. The easier a surface is to clean and disinfect, the less likely it will spread microbes to healthcare workers and patients. Replacing old equipment and medical furniture with easy to clean new designs can significantly improve disinfection and make it easier overall for healthcare workers. Gary Beaumont is an undergraduate at the University of Hartford studying Marketing and Environmental Studies. At the university he is heavily involved in extra-curricular activities, playing an integral part of the school’s Student Government Association. He is passionate about innovative technologies, especially those that help to improve disinfection in healthcare. Gary loves the outdoors and in his free time he enjoys hiking, fishing, and reading. Otter, J. (2015, June 16). What’s lurking in the hospital environment? The importance of cleaning and disinfection in infection prevention and control. Retrieved August 1, 2015.